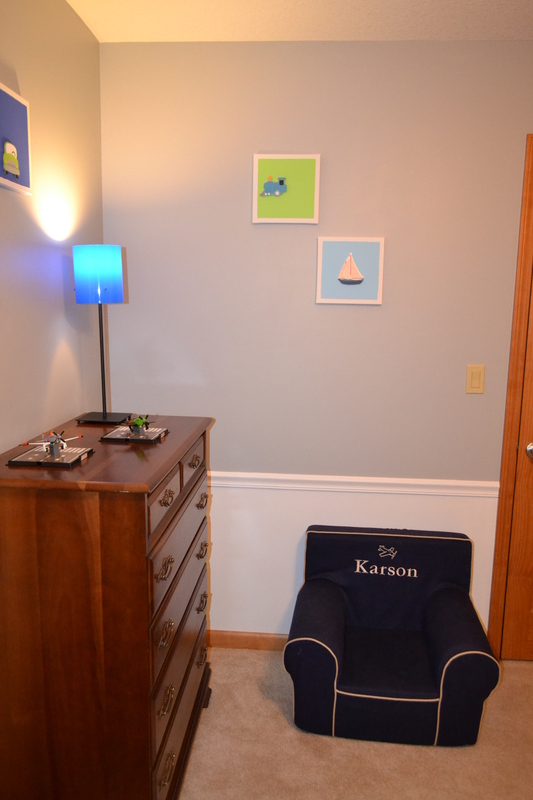 I’ve mentioned in previous posts we would be transitioning K in to the smaller bedroom and giving the twins his larger bedroom. We decided to make this switch while he is visiting with grandparents. This way he can return to a big “reveal”! 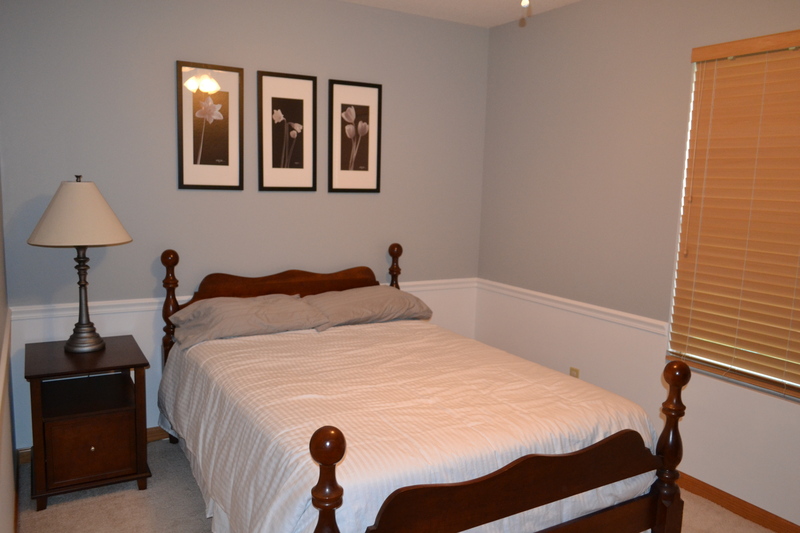 We used an IKEA “Kura” reversible bed as our starting point. 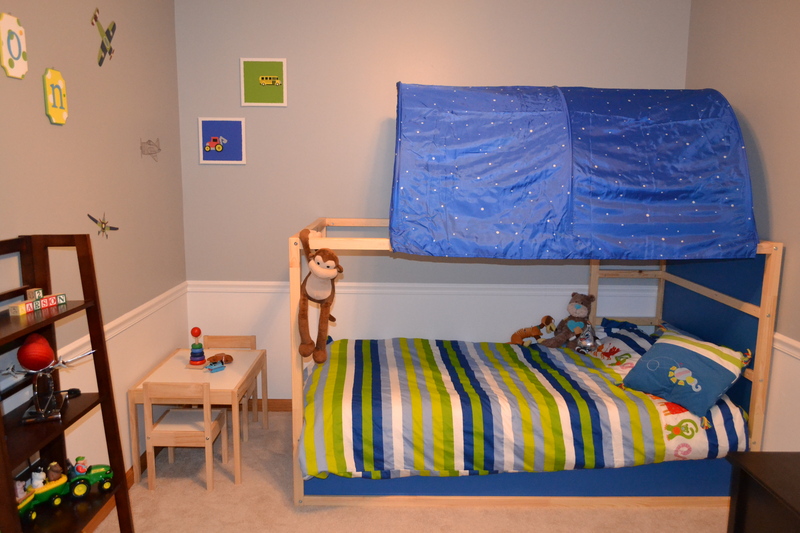 We liked the option to add the colorful blue canopy as a fun accent, and down the road it can be flipped and converted in to a loft bed with play space under neath. The mattress and bedding are also from IKEA. Every other furniture item was something we already had. 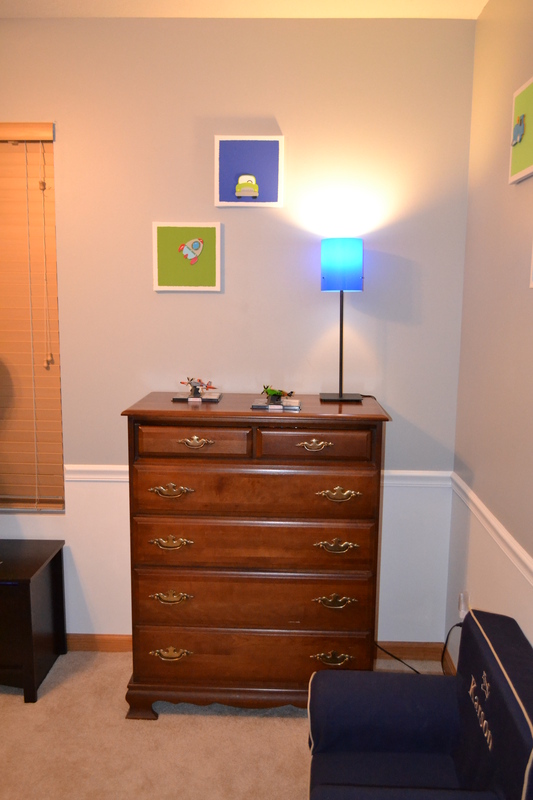 We are using a small IKEA table, (at the foot of his bed), a bookshelf, a toy box, and a chest of drawers. He’ll have a smaller closet, but I’m pleased with the amount of clothing we’ll be able to fit in the chest as well. We are moving on from the changing table days, and hope to focus on involving him more in the process of getting dressed. We’ll be making diaper changes more of a standing affair (like the day care) with encouragement for potty useage soon to follow. In the meantmie, his Pottery Barn Chair will be his “dressing area”. 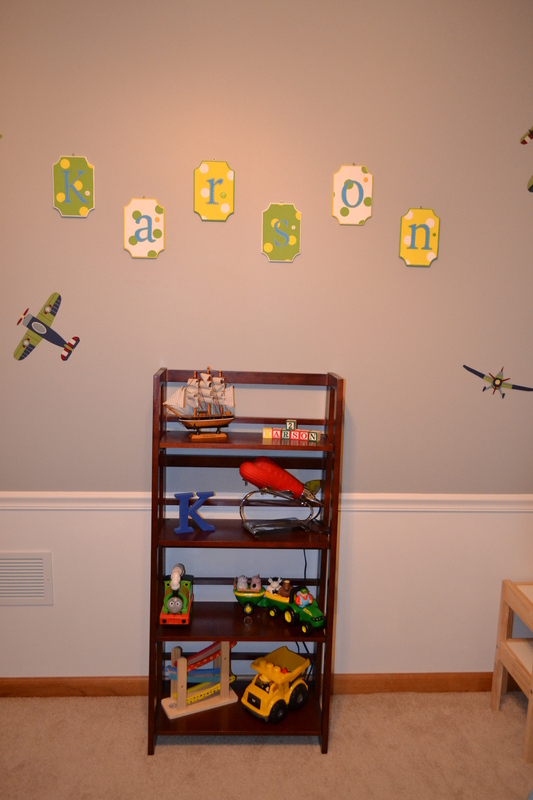 For art work, J wanted to bring over a few of our favorite airplane decals (“Wings” by Lambs and Ivy), and we were excited to finally use a hand made set of letters that spell out his name. (Never quite had a home in prior nurseries). We needed something more, so I went for a homemade option. 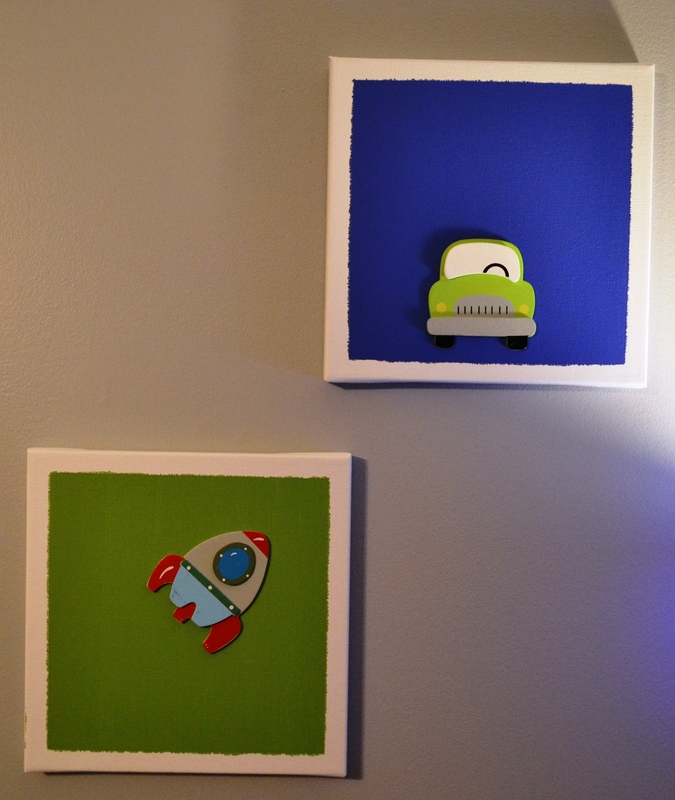 Painted canvas, with a small accent glued on. Simple, fast, and exactly what we needed. So big boy! Hope he loves it!! I’m so curious…..what are the “accents” in the picture frames made of? I absolutely love them!